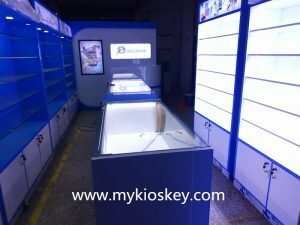 good day everyone!Today my customer arrived our workshop to check his phone shop furnitures we just finished.After he checked our works he is very satisfied with our works.These furnitures looks very nice and attractive. 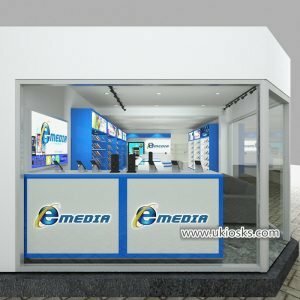 this phone shop is 50 sq meters.not big,but you can see,this shop made full use of space.Totally used white and blue color,looks very attractive and modern.top fixed many advertising posters. when enter the shop,fristly you will see a sofa,you have sit there have a break. 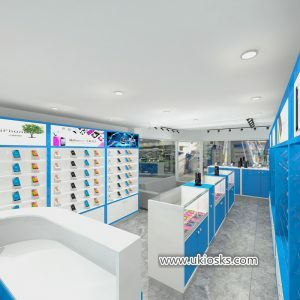 and then enter inside,left and right are many tall wall phone accessories display cabinets,middle are some retail shop display showcases. 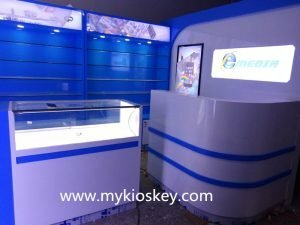 Then back of the shop is cash counter with feature wall. 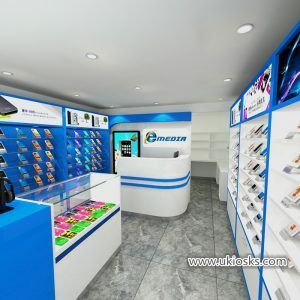 if you also wanna customized your own retail phone shop,do inside cabinets and furnitures. 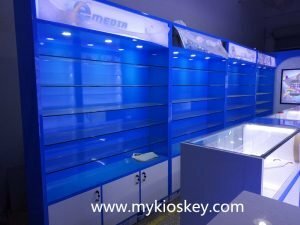 3.if you have no floor plan,don’t worry,we can talk how to layout,then we will make a floor plan for you check.if ok,then you choose interior furnitures style,and how to match shop color,then we design your shop for you see effect.